I have a few wonderful things to report! 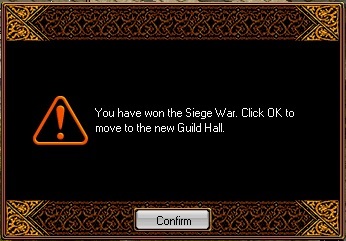 First off, guild wise, this was a very, very good week for us. We reached triple digits in our guild hall level, which is very exciting, though can't say it was the most exciting thing to happen to us. We also ran a perfect Point War run. Let the happy dances commence. 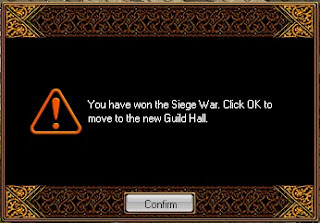 Which means that, for the first time since I joined this guild, we got to attack a hall with the chance of finally having a level four hall. I think all of us were super excited and quite a few turned up to this momentous event. It seems we took the opposing hall by surprise, as they only had a few people. Granted, those people did hit very hard and a few of our troops fell, but a majority of us broke through their ranks and in less than five minutes, this message popped up on my screen. Let the even happier dances commence. So, this is how our guild emblem looks now. Yay! Very exciting for all of us and we were all in high spirits. As for me, there was some very good things that happened to me as well. First off, this is my end level after this 2X weekend. I actually gained over 20 levels this weekend, though I am disappointed that I didn't make 500 like I had wanted. I think this was because of one specific reason. I was in probably the most awkward leveling gap ever. Every place was either too low or too high until I reached 480 or so. I've already decided that when I rebirth, I am not rebirthing under 480 just so I don't have to deal with this frustration ever again. Frustrated, also, because I haven't run Heaven SD, even though I have my full Redstone. Jigg keeps saying, "No, you need to run Spine SD with these people because of the experience." I understand that, and I wasn't planning on doing it during a PH weekend, but then at reset, he once more said I should run two SD's and of course, I did, getting a level off of that. Every time I see the Redstone, though, it seems to mock me and I really just wish that it didn't count as an SD just to turn the damn thing in. Oh well, I guess I will get to it eventually. I also got so many U's that I can't possibly start to list them all. I actually stopped taking screenshots, considering the sheer amount that I already have. Quite a few I will most likely sell or keep, and will probably start a page on here to keep track of all the U's that I do drop. Maybe do that tomorrow, tonight I'm just too tired. Also, I can wear my Slender Bow now! It is very exciting but I won't restat until 500+. Don't ask me why, but I feel like an even number like that will make it much more worthwhile. Sadly, I know I'm going to have to give up a few very nice gears I have acquired (Drake Plume, Tenacious Screw Flyer, etc.) so that I can shuffle around to a good Knowledge Archer build. I do have to find out a good distribution of stats and will have to do a little more math for that, but maybe tomorrow or the next day, I will finally have it all sorted out and you will find a pro Knowledge Archer in your midst. Until then, I will see you around Prandel. Have fun and happy hunting.